Sunday June, 26th, 2011- The course record at the Mt. 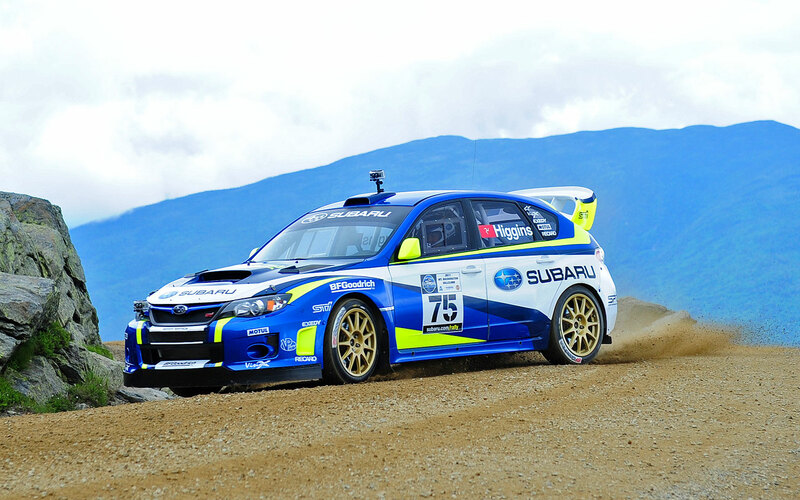 Washington Hillclimb, one of Americas oldest auto races, was smashed today in convincing fashion by professional rally driver David Higgins at the wheel of a Vermont SportsCar prepared 2011 Subaru Impreza WRX STI. Higgins, from the Isle of Man, broke the course record, which stood for thirteen years, by over thirty seconds at the revived 'Climb to the Clouds', which was last held in 2001. The new time to beat to the summit of the 7.6 mile sinuous asphalt and gravel Mt. Washington Auto Rd. is 6 minutes and 11.54 seconds, nearly thirty seconds faster than the outgoing record. The Climb to the Clouds featured nearly seventy competitors driving an eclectic mix of modern rally cars, purpose built hillclimb cars and a small group of vintage racecars steeped in motorsports history. Weather conditions had been less than ideal throughout the two practice days on Friday and Saturday, with intermittent rain showers that blanketed the Auto Road in clouds. The weather kept the competitors from having a chance to practice on the upper half of the course thus adding to the challenge. On Sunday however the weather cleared and two full course timed runs were held, although dense fog engulfed the summit for parts of the day. Higgins was the last driver to launch off the start line which helped to build the anticipation of a possible record breaking run amongst the fans in attendance. Higgins set a blistering pace on his first run, breaking the record by over twenty seconds, but had even more speed on tap on his second run where he lowered his new record by a further eight seconds. The previous record of 6 minutes and 41.99 seconds was set by Mt. Washington Hillclimb ace Frank Sprongl in 1998. "It was a very big challenge because the road was still wet in spots and would turn very slick suddenly. With the clouds the visibility was so low I could hardly see past the hood of my car," explained Higgins. "Our Subaru is setup perfectly for a road like this but I have never raced here before and it was a lot of work to try to learn the course. It's fantastic to have the record at such a prestigious event." In second place was Todd Cook of Tempe, Arizona in an open-wheeled TCE/Wells Coyote hillclimb car and in third place was Paul Tingaud in his crowd favorite Audi "Super Chicken" Hillclimb Special. Tingaud held off former Mt. Washington Hillclimb record holder Paul Choiniere, driving a Hyundai Tiburon all-wheel-drive rally car, by just one-second for the final podium position. A new speed record of 114mph, measured at the Quarter Mile section of the course, was attained by veteran hillclimber Jerry Driscoll at the wheel of "The Patriot", his bespoke hillclimb car. 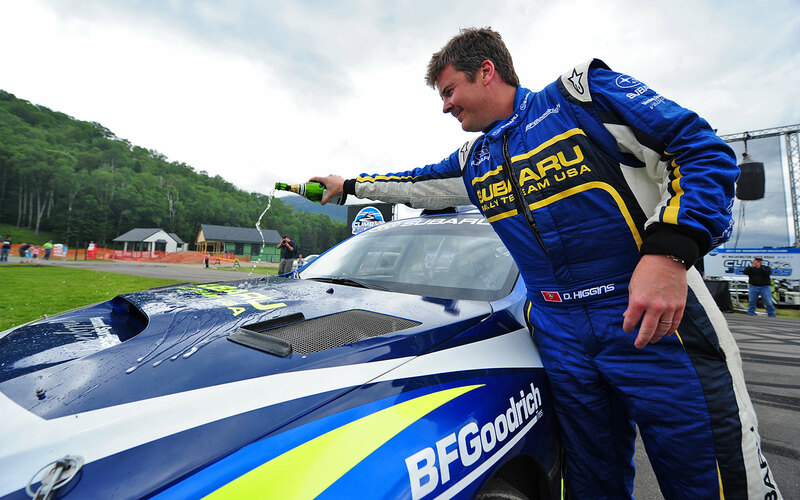 Driscoll, of East Randolph, Vermont, set the outgoing Speed Record of 113mph on the Mt. Washington Auto Rd. course in 1998 driving the very same car. The Mt. Washington Auto Road welcomed for the first time a truck to race up its narrow serpentine course as daredevil Mike Ryan of Santa Clarita, California raced his purpose-built Freightliner Cascadia race-truck, with an amazing 1,950HP, in the Hillclimb Special Class. Ryan was an impressive 27th Overall and commented that, "it was a terrifying and challenging ride to the top and at the finish I truly felt like I accomplished something." Winning the all-wheel-drive Rally class (R1) was Robert Martai with his co-driver Fabian Sannet in their 2008 Mitsubishi Evo X. While the two-wheel drive (R2) class was won by local rally driver Chris Duplessis and his co-driver Sarah Trask, both of Littleton, New Hampshire in their 2011 Ford Fiesta. Of the four Hillclimb classes, meant for regional hillclimb racers and their cars, the Hillclimb-1 class was won by Sherman Baumen, while the Hillclimb-2 class was won by Jamie Melhuish in his 2003 BMW M3. Melhuish, of Newtonville, Massachusetts finished an impressive 7th Overall. The Hillclimb-3 class was won by Tim Mather in a Nissan Sentra and Hillclimb-4 class was won by Nick Wheelock at the wheel of his 2004 Subaru STI. The Vintage Class featured a lineup of prestigious racing cars from the 1930's and 1950's. Although all the entered vehicles are steeped in motorsports history none as much so as an extremely rare 1933 Alfa Romeo 8C 2300 that won Le Mans with legendary Grand Prix driver Tazio Nuvolari at the wheel. The 8C was shipped across the Atlantic, and in 1937 it raced and won the Mt. Washington Hillclimb. It was raced on Sunday by current owner Peter Sachs. Also competing was a 1934 Reuter Special known as "The Old Grey Mare," and a 1951 Jaguar XK120 known as "The Beast" which Sherwood Johnston piloted in the 1953 to a record-breaking run of 10 minutes, 47.6 seconds. The Vintage Class roster also featured a 1931 Studebaker factory Indy car, one of only three that were built, that won the pole at the 1931 Indianapolis 500 as well as raced and won the Pikes Peak Hillclimb the same year. First opened in 1861 as the Mt. Washington Carriage Road, the Mt. Washington Auto Road, located in Pinkham Notch, New Hampshire is the country's oldest man-made attraction. The 7.6 mile Mt. Washington Auto Road is one of the ultimate challenges for driver and automobile. The serpentine tarmac and gravel road is lined with trees and dramatic drop-offs as it winds its way to the 6,288 foot summit of the Northeast's tallest peak. Considered to be one of the oldest motorsports events in the United States, the Climb to the Clouds was first run in 1904, seven years before the first 500-mile race at the Brickyard in Indianapolis and twelve years prior to the inaugural Pikes Peak International Hillclimb in Colorado. The last time the Climb to the Clouds was run was in 2001. 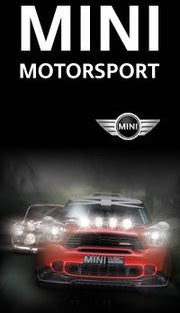 Organized by Vermont SportsCar and sanctioned by the Sports Car Club of New Hampshire, the 2011 Mt. Washington Hillclimb served as one of several events to help celebrate the 150th anniversary of the Mt. Washington Auto Road as the nation's oldest man-made attraction.